On January 26th, PadMan the world’s first feature film on menstrual hygiene will release in theaters. Based on the story of TIME Magazine’s 100 Most Influential entrants Arunachalam Muruganantham, a rural welder from India turned incredible innovator and inventor, who was moved to provide women with access to high-quality and affordable sanitary pads 20 years ago. Billed as the most progressive family entertainer yet, it stars Akshay Kumar (Toilet: Ek Prem Katha) who assumes the titular role of Arunachalam Muruganantham to once again showcase his commitment to social entertainers. He is joined by critically acclaimed actresses Sonam Kapoor (Neerja) and Radhika Apte (Kabali). 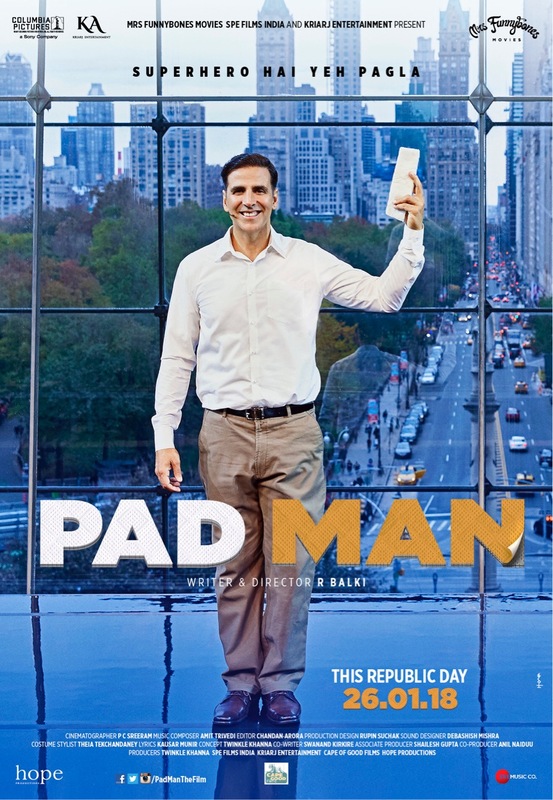 Produced by Aruna Bhatia, Mrs Funnybones Movies, Sony Pictures Entertainment, India, Kriarj Entertainment, Cape of Good Films and Hope Productions, PadMan is written and directed by ad-man turned film-man R Balki (Paa). In this 3rd poster we see Akshay standing in front of a big window that has a big city as it’s landscape. We are guessing New York City since the film did shoot there.